If You Need Dental Implants And Live In Marin County It’s The Best $8 You’ll Ever Spend! The Golden Gate Bridge District which maintains the bridge is facing a deficit of $3.9 million and has just raised the cost of coming into San Francisco from Marin County to $8.00 for some drivers. Carpools during rush hour are now $5.00, while those with FasTrak accounts pay $7.00. However, those without a FasTrak account now have to pay $8.00. Guess what: if you need Marin County dental implants that’s a steal! Because the best Marin County dental implants are at San Francisco Dental Implant Center and that’s in Sacramento Street in the Financial District. This is where you will find Dr Alex Rabinovich, and Dr Noah Sandler, two of the finest dental implant specialists not just in California, but in the US. Dr Rabinovich is qualified in both medicine and dentistry and is an expert in Dental Implant Surgery and bone regeneration procedures, Corrective Jaw Surgery (Orthognathic and TMJ), and Facial Reconstruction (Trauma and Cleft Lip and Palate deformities). He takes part in medical missions overseas where he performs surgery on children in need on a voluntary basis. He has also authored a number of medical articles and is frequently invited to speak at dental conferences. Dr Rabinovich has performed several thousand dental implant surgeries. Dr Sandler has performed oral surgery in Minneapolis, Minnesota for 20 years and is a noted specialist in this field. He was specifically invited to join San Francisco Dental Implant Center by Dr Rabinovich in order that the practice could continue to handle the ever-growing number of patients seeking dental implants, having been recommended by friends or relatives. 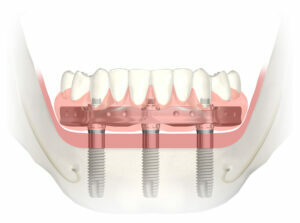 Dental implants are not cheap, so you need to know that you are getting the finest possible treatment. Every patient is different, so it is impossible to provide estimates over the phone, and any practitioner who does so should be treated warily. Some patients will need more or less treatment than others. One thing that should be noted is that there are cheap imports of dental implants on the market, but Dr Rabinovich and Dr Sandler do not use them: when you are having dental implants you want ones which are going to last. If you need Marin County dental implants you will be pleased to know that we offer a wide variety of financial options including some which are interest free. Both Dr Rabinovich and Dr Sandler provide all patients with a totally free consult when they can assess your situation and quote you a fixed rate for the treatment. There are no hidden charges later. So, if it costs you 8 bucks to cross the bridge, it will be the best $8 you have ever spent! This entry was posted in Blog and tagged affordable dental impalnts, Bay area dental implants, dental implant, Marin County Dental Implants on August 9, 2018 by Dr Alex Rabinovich.